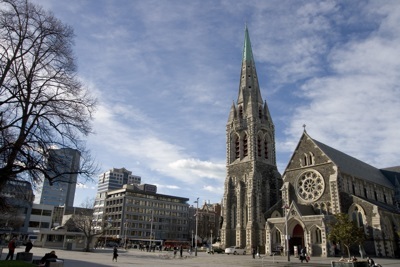 Christchurch is the largest city on the South Island of New Zealand, and over all the second largest city and third largest urban area in the country. As of 2006, Christchurch had an estimated population of 359,900. Congratulations! You've Found the Ultimate Guide to New Zealand Travel! This New Zealand Guide is now available to download to Kindle, Android Phone, iPhones, iPads, and other tablet devices. So what are you waiting for?! You are super lucky to be going to New Zealand, and this guide will let you know all of the coolest things to do, see, and eat around the country, including popular destinations like Christchurch, Queenstown, Auckland, and Wellington. This two-day tour showcases the highlights of Christchurch post-earthquake. This itinerary takes you to museums, monuments, a garden, a gondola, an ocean, as well as some local craft brews and good chews! This itinerary has been written for a traveller with the general theme of understanding a city and the natural phenomena that have taken the core out of the city, and how we are getting our core back together! The traveller age that would suit this itinerary best would be from mid-20s and onward. The focus is not only to party and have a wild time, but to experience the culture that is on offer and really get into it. Unfortunately, Christchurch (and New Zealand) is not a cheap place to travel, expect $5 coffee and $15-$20 lunch. There is a good mix of walking, taking mass transportation and even a bit of driving! Christchurch has been rebuilding from a devastating series of earthquakes since September 2010. The city looks quite damaged and vacant, but has a lot to offer, you just have to know where to look! This city of approximately 300,000 residents is one of the largest southernmost cities in the world. If you have been to Christchurch pre-quake, this guide will be particularly good for information on the rebuilding. This guide will take you to a few lesser known guidebook spots, such as a cathedral constructed from cardboard! Driving directions to the beach, great restaurant and nightlife recommendations are also included. From a local perspective, you will learn what is open now, post-quake, and how to locate it! The best time to visit Christchurch is within its summer months, December - March. Expect more crowds during this time. The shoulder season is also very nice, November and April. The winter months, June-September, can be quite rainy. Christchurch is very enjoyable, even in the rain, but if you do travel in the winter be sure to bring an umbrella! For comparison, the weather and artistic atmosphere can be compared to a micro-Portland, Oregon. I’m happy to entertain any questions, feel free to email! Enjoy. You are super lucky to be going to New Zealand, and this guide will let you know all of the coolest things to do, see, and eat around the country, including popular destinations like the North Island, South Island, Auckland, Wellington, Lake Taupo, Christchurch, and Queenstown.